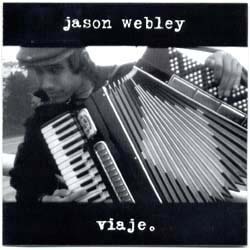 Recorded quickly and simply in his kitchen, Jason's first album remains his rawest and most honest work. "Viaje" contains several of his signature songs: "Without," "Old Man Time Aint No Friend of Mine" and "Music that Tears Itself Apart." "Insightful and earnest songs bring you to tears. Make you sob like your mother died. Then, with his genius showing like toilet paper on the shoe of a priest, Webley turns his music into a drunken bar fight." Mixed and mastered at Emerald City Productions. With: Vernallis, Sean Lyon and a bunch of drunks.